Tired of BORING old jack-o'-lanterns? Sick of the same old soggy pumpkins decaying on your front porch? Do you think Billy Corgan should be smashing tropical fruits in lieu of orange cucurbitaceae? Have you been reading this entire paragraph in an overemphatic, "As Seen on TV" announcer-person voice? 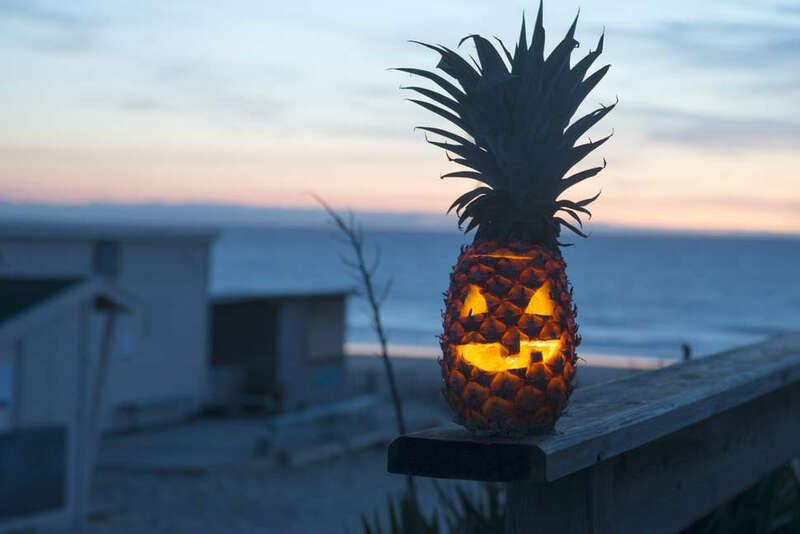 Then maybe carving a pineapple this Halloween is what you need to take your spooktastic Halloween to the next (increasingly spooktastic) level! BUT WAIT! THERE'S MORE! Well... actually, there's not. Except for more pictures of these pineapple jack-o'-lanterns. They bring the tropics to you! Pineapples were considered a status symbol in the 1700s -- you could even rent the suckers out for the hour! This is bringing some of that pineapple-y class back to what is surely America's least classy holiday. Like this goofy guy. He's just plain silly. This election cycle is really having an effect on everyone, even decomposing fruit. Which one is Keyser Soze?! Like this guy. I'm pretty sure this is permanent. Have fun! But not too much fun. This is Halloween, not Earth Day.